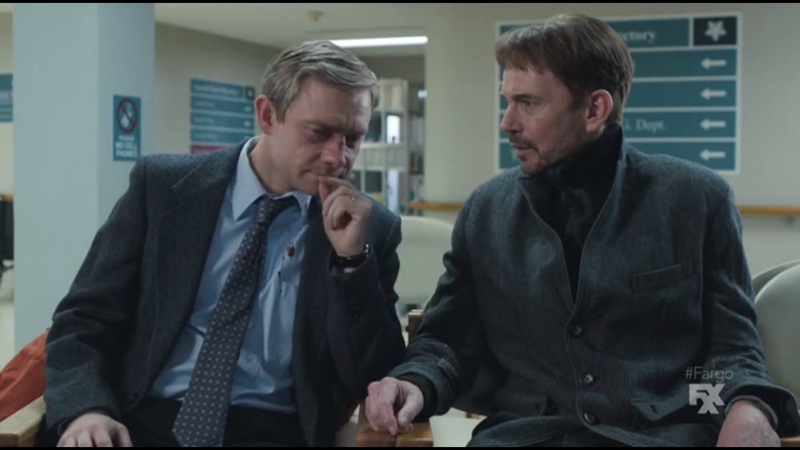 A Look at Fargo- Series Premiere: “The Crocodile Dilemma” | What Else is on Now? Turning a film into a television series can be a challenge. You don’t want to just use the exact same story, premise and dialogue, word for word because people will write it off as more of the same. At the same time, if it doesn’t capture the spirit of the original, you may wonder what the point was in trying to create something new out of something old. Fargo, first and foremost, is not a remake or reboot of the Coen Brothers’ 1996 film. The only things these two share are name and location. 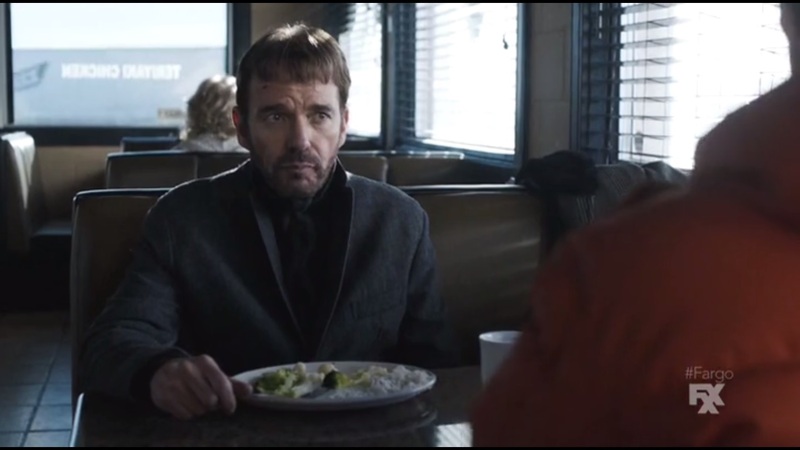 The new miniseries still takes place in the town of Fargo, Minnesota and, right from the start, manages to retain the same dark, comedic tone of the original movie. 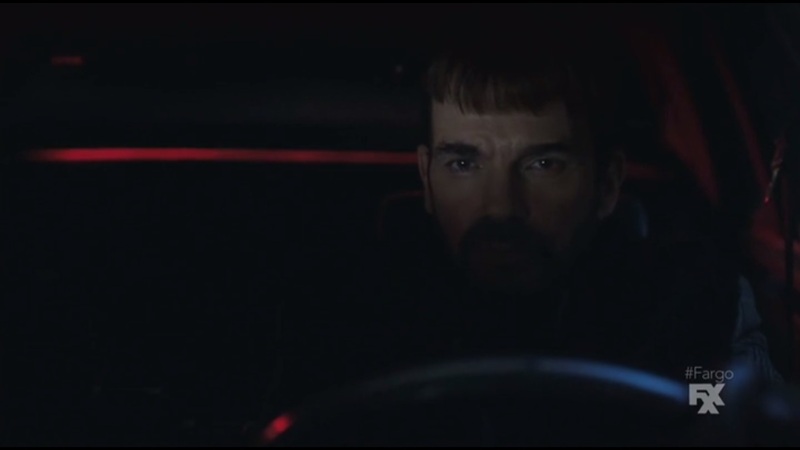 The series begins on a dark, lonely Minnesota road, where we’re introduced to Lorne Malvo, played by Billy Bob Thornton, as he overhears some thumping from his trunk. As he navigates through the night, he collides head on with a deer, causing his car to careen off the road. 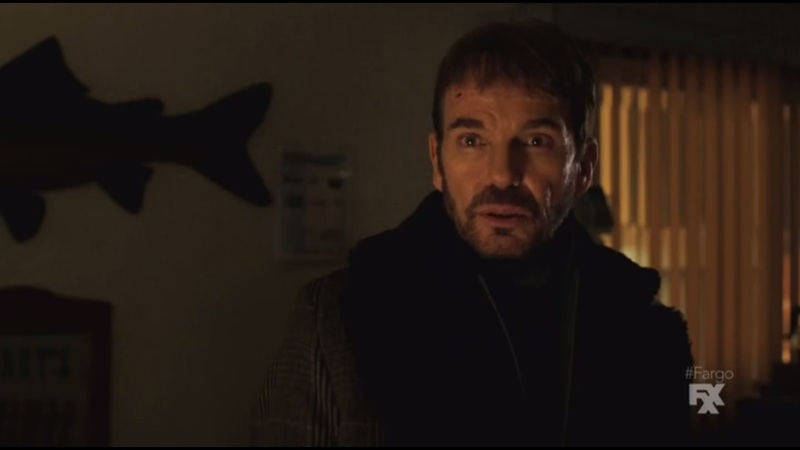 As Malvo regains his composure, a man forces his way out of the trunk and makes his way further into the Minnesota night. 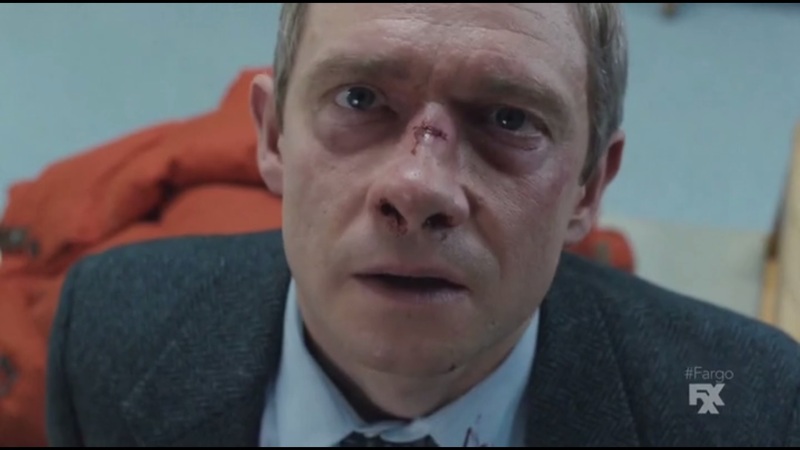 We’re then introduced to Lester Nygaard, played by Martin Freeman, and his wife, Pearl, played by Kelly Holden Bashar. Lester is a salesman and a bit of a sad sack. And poor guy, he gets a run in with an old high school bully, Sam Hess, played by Kevin O’Grady, who reminds him and his two sons about how he once put Lester in an oil drum and banged his now wife of 15 years. Sam lays it on thick and it looks like he’s about to sock Lester in the face, but he doesn’t. This doesn’t stop him from running face first into a door, though. At the hospital, he finds himself sitting next to Lorne, who lends his ear as Lester talks about his problems. Though in Lester’s version of the story, he was outnumbered and outmatched. Lorne, however, is to the point and tells Lester that if a man like Sam had insulted him, he would have killed him. Men like Sam don’t deserve to draw breath. If Lester wants Sam dead, he just has to say the word and Lorne will do it. Looking into the case of the wrecked car are officers Vern Thurman, played by Shawn Doyle, and Molly Solverson, played by Allison Tolman. The deer that Lorne hit is in the trunk, while further into the void, they find a frozen man resting against a tree. There’s a lot to cover in between, but for brevity’s sake, let’s just say that Lorne heads to Hess & Son Transports to get a good look at what’s he dealing with. Sometime later, Lester, already swimming in a sea of problems, heads to a diner to meet up with Lorne, only to learn that Lorne has taken care of Lester’s big problem. Why? Because Lester’s spent his entire life thinking that there are rules. Turns out there are none. Not with Lorne. Fargo is off to a great, dark and twisted beginning. I was unsure what to make of a Fargo television series where the only similarities were title and location, but out of the gate, this shows a lot of promise. Creator and writer Noah Hawley took what worked about the film and, for my money, found a way to make it work for television without straying far from the original formula. That’s hard to do if you don’t have a lot of faith in the source material, but I could clearly buy this as a universe inspired by the Coen Brothers. The tone feels much darker, yet not too far off from the style and feel of the film. I had to remind myself at times that this was a miniseries and not a full length feature film because of the high production values. Like that, this is a quiet Minnesota town racked by sudden acts of violence. And despite how gratuitous the violence is in the pilot, there’s a surprising amount of genuine humor to counterbalance the dark elements. Lorne has a great moment where he checks into a hotel and he asks the woman at the desk about what pets are allowed, only for him to say that he doesn’t have a pet. I’m impressed with how well the pilot is paced. We get just enough information and insight into Lorne and Lester’s characters without giving too much away, but just enough to maintain interest. Obviously we know less about Lorne since he’s shrouded in mystery, but his very persona is what made him such an interesting character to watch. Lorne is a force and Billy Bob Thornton carries a commanding presence whenever he appears. He’s sadistic and out to show Lester that the world is bleak, but also larger than either of them knows. He has a very straightforward view of morality: if he wants something, he’ll take it, no need to dwell before or afterward. What Lorne lacks in conversation, he makes up for through brute force and strength. In a way, he’s very similar to Anton Chigurh. He has no compassion for the weak and will use raw strength to get what he wants. Like Anton, he doesn’t think he’s insane, but that the world around him has problems. He doesn’t believe in rules at all, though Anton believes that rules can be of no use if they bring you to a dire, no-win situation, as was the case with Carson when he met his fate at Anton’s hands. He strikes fear into average citizens and can get them to bend to his well, proving how much influence he has over the power of rhetoric, but also how weak willed some individuals can be. After all, he got a kid he’d never met to take a leak into his boss’ gas tank just because he had said he’d done it once before himself. It’s scary how much control he can wield. This makes him a perfect counterpart to the bumbling Lester. After a few encounters with Lorne, Lester comes out of this episode a changed man. The people around him, from his brother to his wife to Sam, all chipped away at his dignity and sense of self-worth. He’d been a man just walking through life waiting for some misfortune to come his way. All this time he’d been going through the motions of life, but Lorne offered a chance to rebel against the forces that held him down. 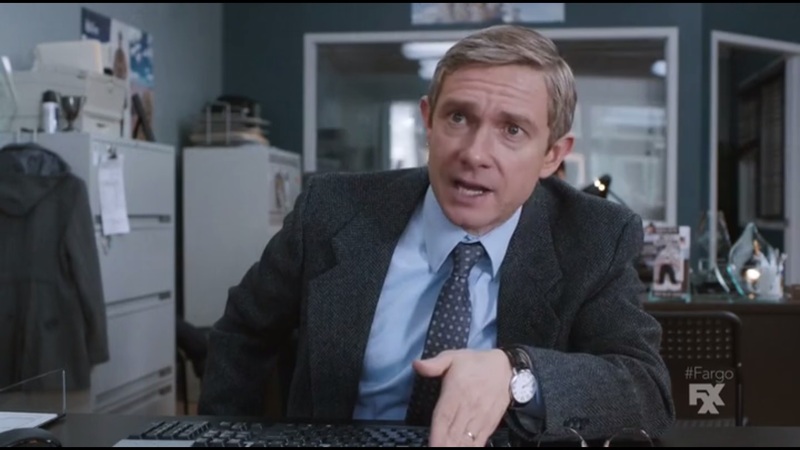 And Martin Freeman is as charming as he is bumbling in his performance. It’s similar to what William H. Macy did with the original film, but it’s important to note that, as this series isn’t a reboot or remake, we aren’t looking at the same character or even a re-imagined version of the character. It’s just another unlucky sap that’s having a bad time. He’s made sympathetic by being at a low point in his life that we want him to rebound, but he’s not entirely relatable due to some of his actions. It sets him down a dark path, I’ll say that. It’s the start of a beautiful friendship between these two men. “The Crocodile Dilemma” was a strong start to the miniseries. Though it felt familiar, we entered into new territory thanks to the new direction and vision that Noah Hawley has crafted. There’s a lot that’s set up and established that will play out as the series continues, most of which includes just how much power and influence Lorne can wield. I didn’t even get to mention roles like Colin Hanks, whose only here for a brief appearance near the end, or Allison Tolman, whose character feels inspired by Frances McDormand’s character from the original, but rest to say they play their parts well. This felt like a very ambitious project and it shows through the direction, but rest assured that the folks behind the scenes know what worked about Fargo and found a way to translate that formula to television. I was hooked from the start and look forward to watching the rest of the series play out. If you’re a fan of the film or even just a fan of dark comedies, give Fargo a watch. This entry was posted in Fargo and tagged 1996, Adam Goldberg, Allison Tolman, Bill Oswalt, Billy Bob Thornton, Bob Odenkirk, Brian Markinson, Bruce Gold, Chaz Nygaard, Coen Brothers, Colin Hanks, Crocodile Dilemma, dark comedy, Don Chumph, Ethan Coen, Fargo, Film, Frances McDormand, FX, FXX, Gina Hess, Glenn Howerton, Gus Grimly, Joel Coen, Joshua Close, Kate Walsh, Keith Carradine, Kelly Holden Bashar, Kevin O'Grady, Lester Nygaard, Lorne Malvo, Lou Solverson, Martin Freeman, Minnesota, Molly Solverson, Mr. Numbers, Noah Hawley, Oliver Platt, Pearl Nygaard, Shawn Doyle, Vern Thurman, William H. Macy by omarid513. Bookmark the permalink.